Get a Fujitsu & TC Air and Get Rewarded! 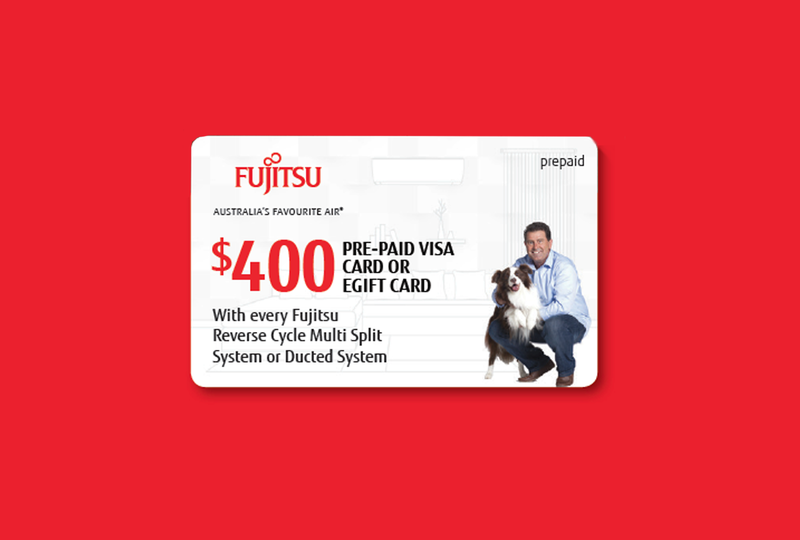 Between 1 April – 1 July ’19, when you buy a Fujitsu Air Conditioner with TC Air you’ll receive a Pre-paid Visa card or eGift card worth up to $400. Plus, go into the draw to ‘Win 1 of 5 Family Holidays’ valued at $12,000. The ‘Win 1 of 5 Family Holiday’s’ draw will take place at Prime Focus, Level 1, 500 Chapel Street, South Yarra VIC 3141 at 12 noon AEDST, Friday 25th October 2019. Winners will be notified by phone and in writing via email within two (2) business days of the draw and their names will be published here from the 28th October 2019. The first five (5) valid entries drawn will each win the prize of a family holiday valued at $12,000. Each prize will be awarded in the form of 2 x $4000 and 1 x $2000 Flight Centre eGift cards, plus 4 x $500 Fujitsu Pre-paid Visa cards. See full terms and conditions below for further details.